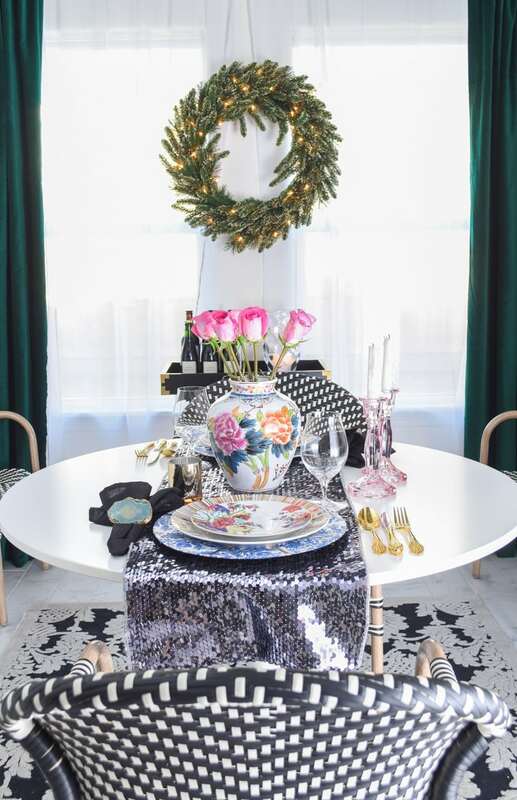 Today is all about glam, eclectic and FUN dining room holiday decor. 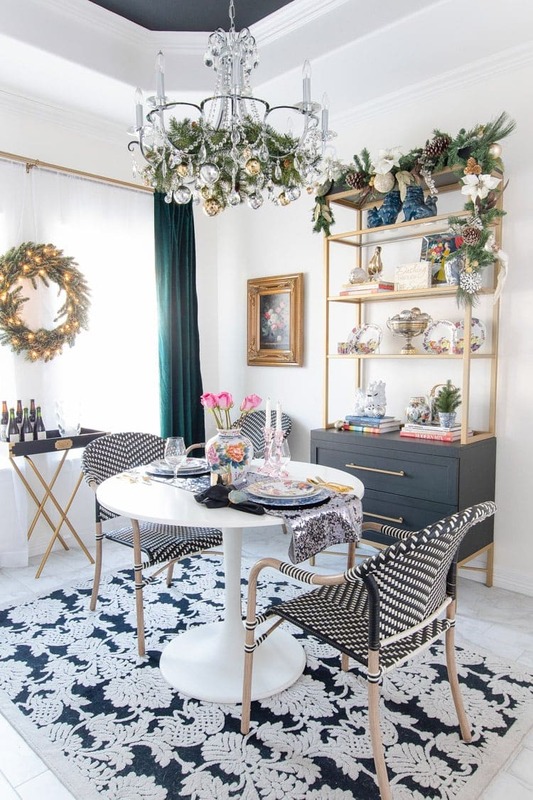 I have a small dining space, but I try to pack it with style while still keeping it chic, simple and cozy as part of Domicile 37’s Winter Eclectic Holiday Home Tours! If you’ve come here from my friend Corinna’s blog, I welcome you! I adore her beautiful, boho chic home. 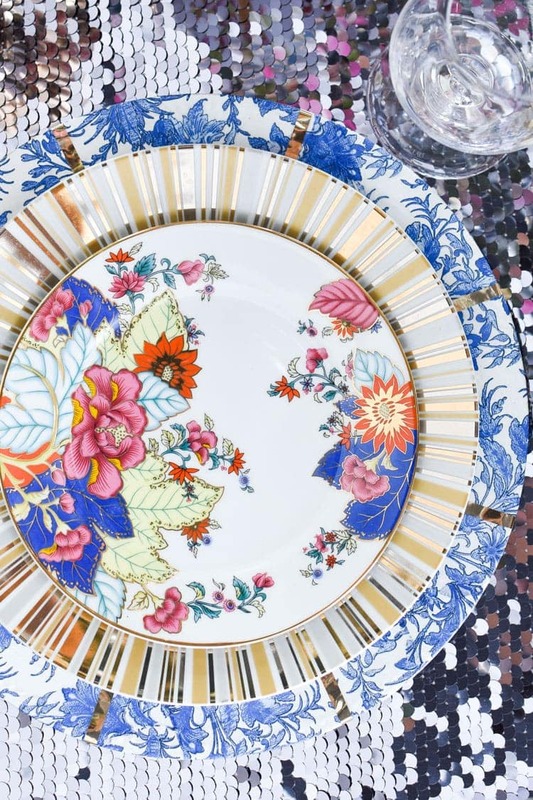 My home isn’t boho at all, but I have a thing with a chinoiserie. 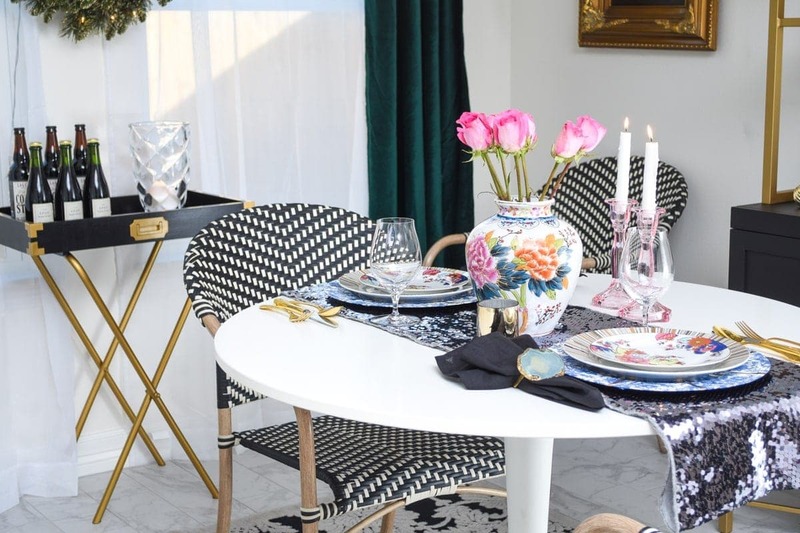 My love affair with all things tobacco leaf china and decor has been well documented, so of course I had to use my fave Imperial Leaf china on the table. 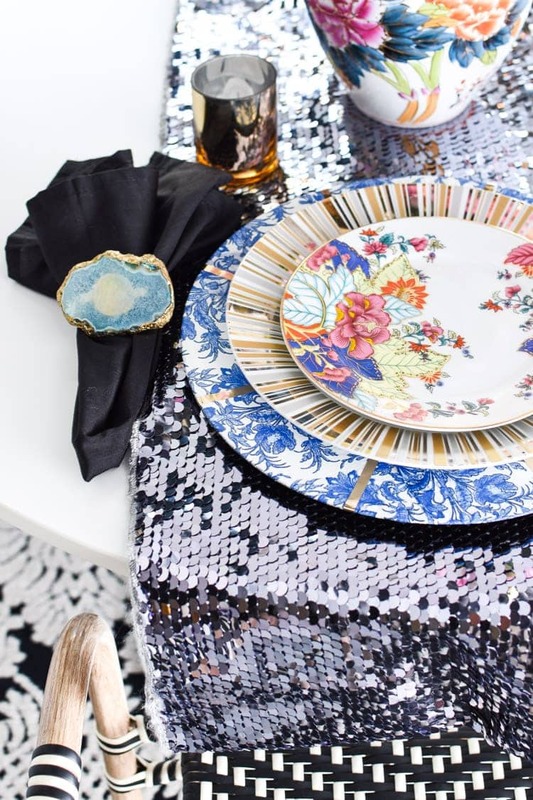 I paired the tobacco leaf china with my DIY dollar store blue and white chargers and a sequin runner for an extra festive, glam look. The vase is a vintage/antique piece I snagged from one of my fave Instagram shops, Lillian Grey Vintage Home. 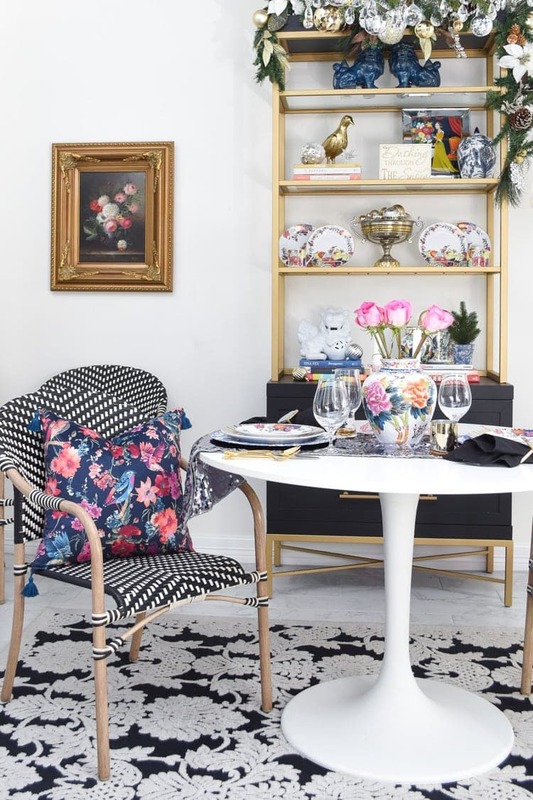 I love the bold florals, and the vase makes me smile every time I see it. 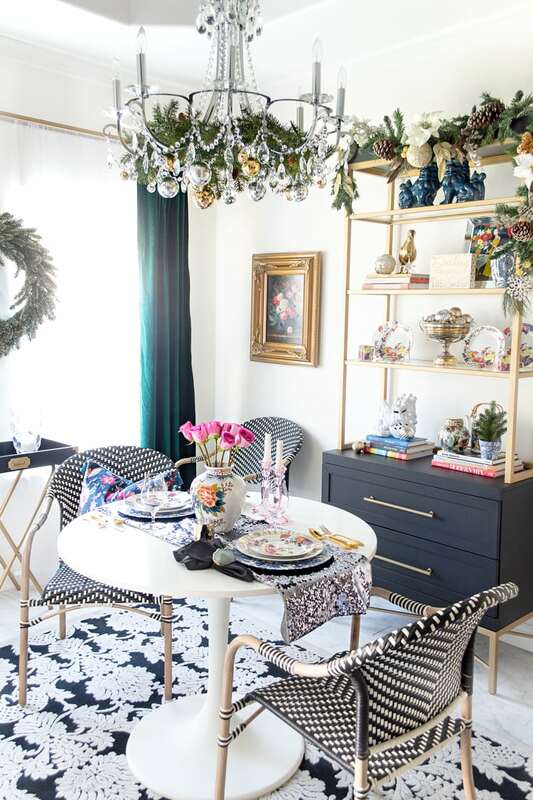 Decorating a small dining space/nook/room for the holidays can be a bit challenging because you want to pack style without making it feel cluttered. 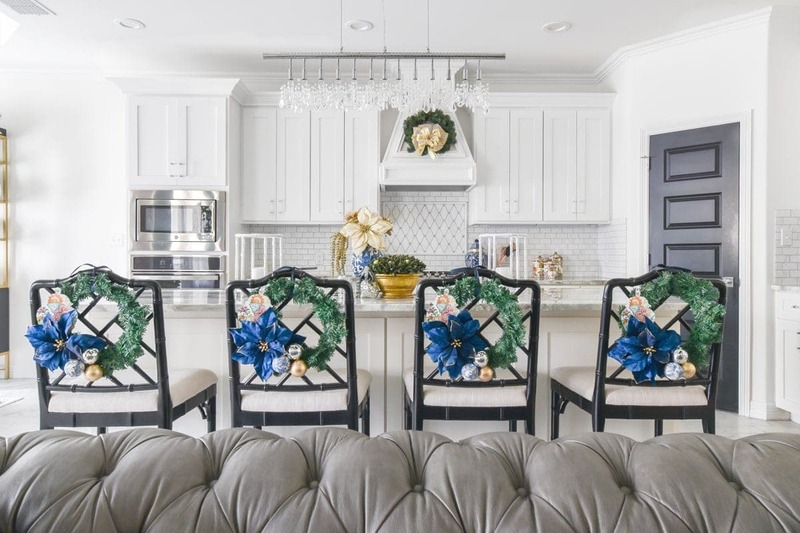 My approach to dining room holiday decor this year was to omit the Christmas tree and bring in holiday accents. I decorated my crystal chandelier with garland, and I also added a garland to the top of my black and gold etagere (which got relocated here from the living room). 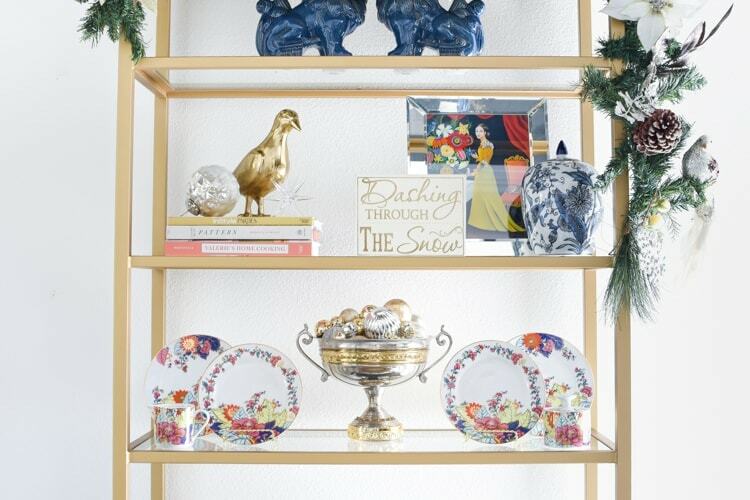 Decorating that etagere has become a bit of a favorite thing of mine to do. 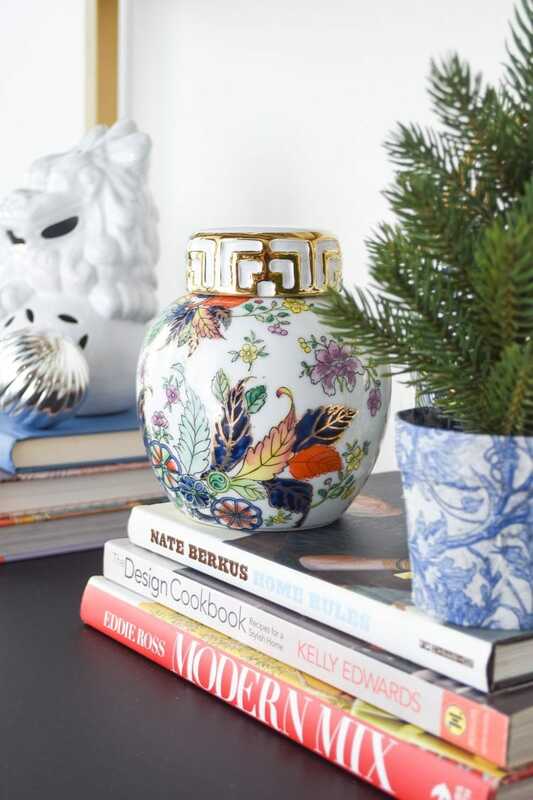 I love that I have plenty of space for my various chinoiserie finds, like this little tobacco leaf ginger jar. 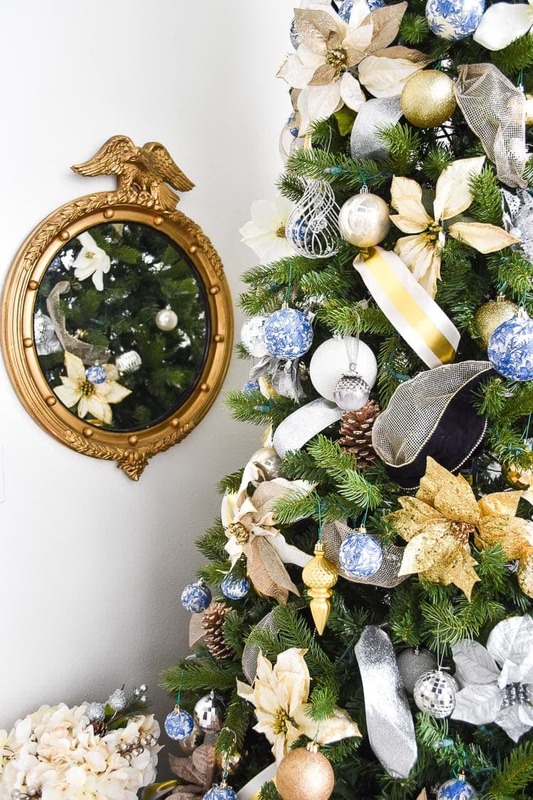 I also have plenty of room for more dining room holiday decor because I simply toss unused ornaments into vases and plop them into empty spaces. Makes any decor vignette that much more chic. I’m actually super happy with how this space turned out even without a Christmas tree here. I feel it allows my eclectic, thrifted antique finds stand out a bit more. You may have noticed I only have a pair of chairs around the table, and this is because I wanted the space to feel a bit more open. The other chairs are flanking the windows, so it’s super easy to grab them if we have extra company. I know sometimes my layouts can be untraditional, but I truly believe you should set-up your decor and spaces to suit your own lifestyle and family needs. 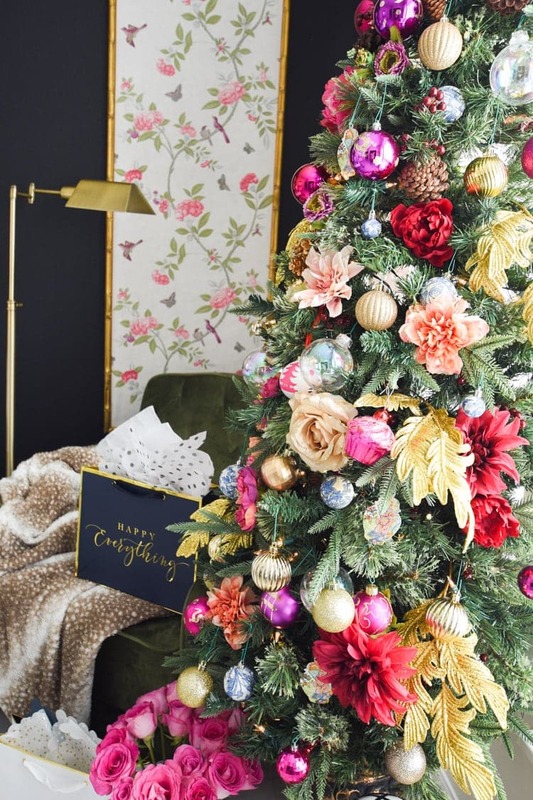 And it’s also fun to mix and match to create decor that feels fresh and festive. You know, buying these $44 outdoor patio chairs for this space was probably one of my smartest purchases this year. I love how casual they are. Wow Monica, This looks amazing. I love all the little details and the colors! 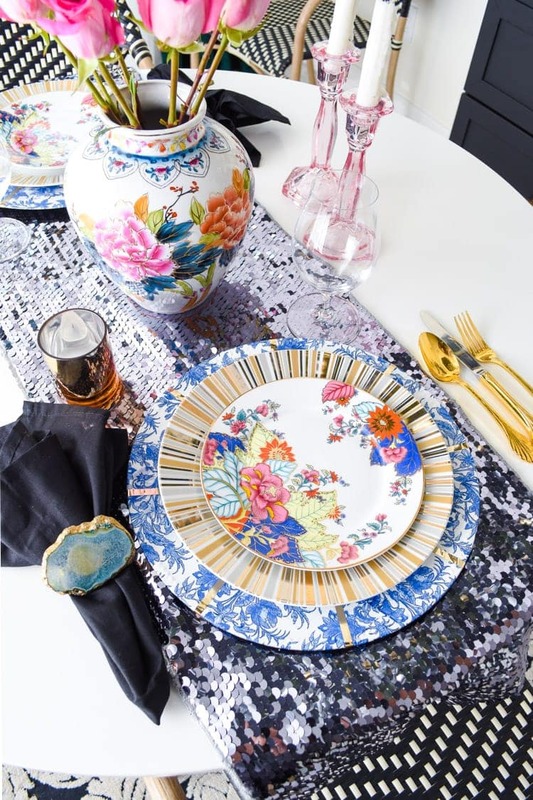 Your table setting is gorgeous! 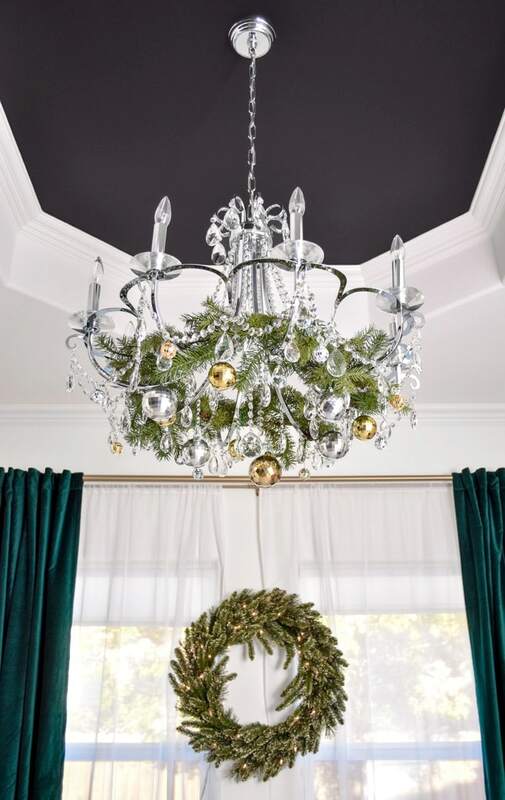 Love the garland on the chandy. Your decor and photos are beautiful as always. I always enjoy seeing what you are up to, Monica. 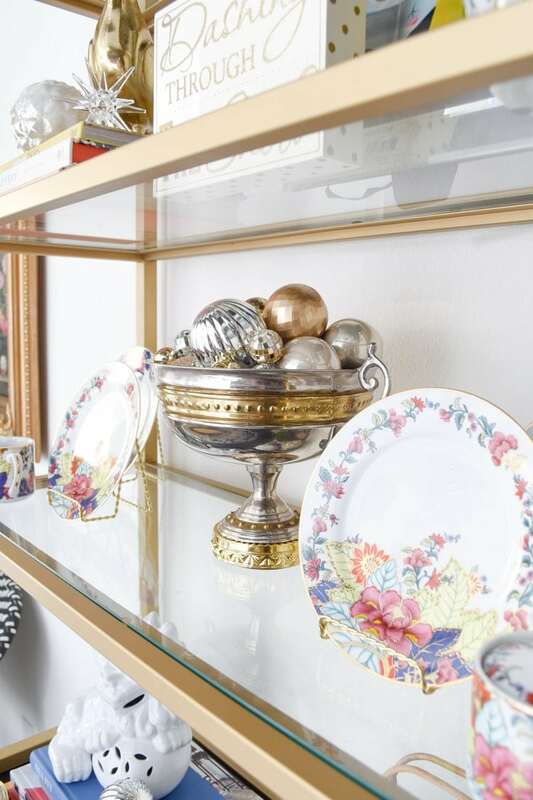 Your gorgeous home is making me want to go glam again (I am a chinoisserie fan too!). Looks fabulous! 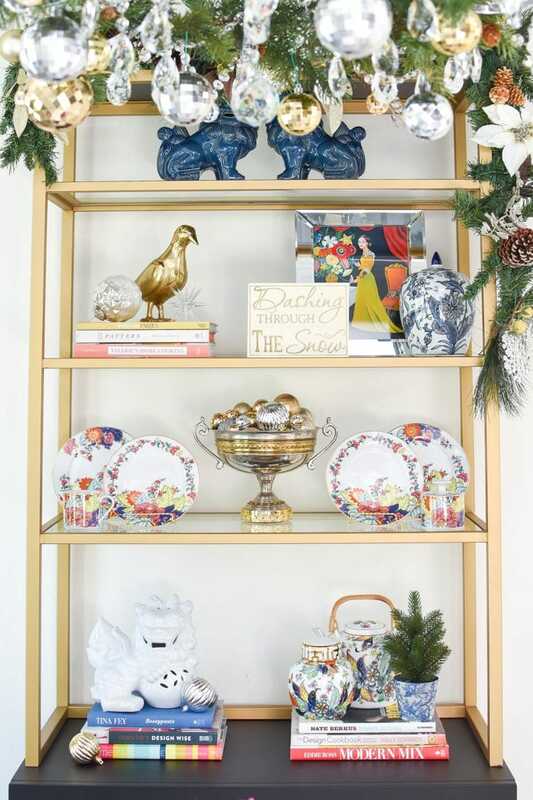 Love, love, love your gorgeous table setting and I adore the etagere in the dining area. It is perfect for that space.